OK, that's just beautiful. You get to wake up to that view every morning? Nice! He he he! That would be a great view, wouldn't it. Umm ... not to burst anyone's bubble, but that's not the real McCoy. It's a pic of a good model. If you want to see a pic of the real thing, go to my web site. 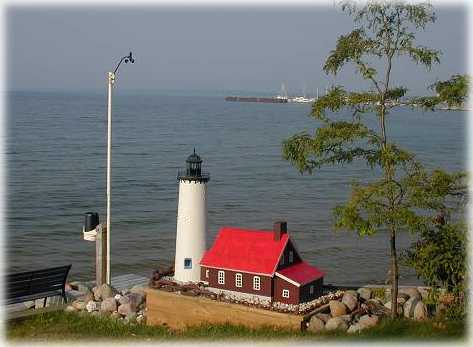 I have pics of several Michigan lighthouses, including the Tawas Point Light. EDIT: I may have to modify my statement. That might be Lew's actual view. What I meant was that isn't the actual lighthouse. Well. that is my actual view. The real lighthouse is out in front of the house across the Bay. The model shown in the photo is a 1"=1' scale of the lighthouse tower that I got through John (WXWP at Lighthouse Weather ) from a guy in Delaware who builds lighthouse models. The keeper's house I built using dollhouse materials. The model sits next to the Davis weather station. I'm just happy if I wake up each morning. The view is a bonus. That is an awesome view! Wow, am I envious! That is also a very cool model. For a school project this last fall my son built a model of the Tawas Point lighthouse (well, guess who actually did much of the work ... mom and dad ). I designed the conical tower to scale (the math part), and he selected various shapes (mini cereal boxes, etc.) for the rest. We hot-glued it all together and painted it. We left it out for show over the holidays for visitors to see; naturally it has since been relegated to the basement. He he he. How true for many of us.